What’s Next for Farmland in the Midwest? So, you watched land values climb and climb and climb. Now there appears to be a lull. Commodity prices have dropped back to ‘normal.’ There is talk of rising interest rates. Have land prices peaked? Plateaued? Is the run-up over? Is there an ‘adjustment’ coming? What about rent rates? Join the Illinois Society of Professional Farm Managers and Rural Appraisers as they take an in-depth look at what’s next! And now you can take a look at what’s on the program for our conference. Those who register and attend the conference will receive a complimentary copy of the 2014 Illinois Land Values and Lease Trends Report. If you’re not planning to attend, or need an additional copy, you can reserve one online. Here’s a look at the agenda of the upcoming conference, along with information on registration. You can fill out your registration form online here. Find lodging information at the bottom of this page. Download the agenda in PDF form. Come and join representatives from your Commercial Sponsors as they host this wine and cheese celebration. Trade Talk displays will continue on Thursday, February 13. John writes humor & commentary, appearing monthly in Farm Journal and Top Producer magazines as a contributing editor. His family farm is now in its sixth generation in Edgar County. Michael received his bachelor’s and Master’s and Law degrees from the University of Illinois. His practice concentrates in real estate, business, income tax and estate planning, and trust and estate administration for farmers and land owners. 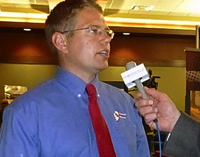 He is considered the leading Illinois attorney in agricultural law. Just What IS the Howard G. Buffet Foundation? The Howard G. Buffett Foundation (HGBF) is a private family foundation working to improve the standard of living and quality of life for the world’s most impoverished and marginalized populations Chad E. Shipmaker is the Foundation’s Deputy Director, supporting the organization’s programs and grantmaking in the United States and internationally. What’s New in Washington, D.C.
Stephen Frerichs is principal at AgVantage LLC in Alexandria, Virginia, a consulting and lobbying firm. Stephen specializes in budget, agricultural and credit issues. Breakfast — Because this is a plated breakfast tickets for the meal must be reserved on the Registration form. Referred to as a “tireless, effective leader for rural farming communities,” Flider was appointed by Governor Pat Quinn as director of the Illinois Department of Agriculture Feb. 15, 2012. The appointment enabled Flider, a former lawmaker and mayor in east central Illinois, to continue a career dedicated to public service. Standard Room $86.00 plus tax per night. Rooms may be reserved by calling 217-422-8800. The deadline for making reservations in this room block is January 11, 2014. Reservations made after that date will be accepted on a space-available basis. Check-in time is 4:00 p.m. and check-out time is 12:00 p.m. A late-departure charge may apply for any room occupied after the checkout time. This is the first completely comprehensive study in 20 years of the full scope of services provided by members of the Illinois Society of Professional Farm Managers and Rural Appraisers. Download Partners in Illinois Agriculture Report. The 2013 Illinois Land Values and Lease Trends Report is now available as a PDF download at no charge. This is a large file and may take a few minutes to download. (Decatur, IL, August 28, 2013) While the number of Illinois farms being offered for sale is down compared to a year ago, the value for what is being sold is up modestly across the board, according to the 2013 Mid-Year Land Values snapshot survey conducted by the Illinois Society of Professional Farm Managers and Rural Appriasers and the University of Illinois. The results of the survey were released here today. Aupperle notes that this dynamic has kept prices paid for land steady. “On July 1, 2013, farmland prices aver- aged $13,200 for excellent quality farmland, $11,200 for good land, $9,000 for average quality land, and $8,300 for fair quality farmland. This is an increase of 3 percent for excellent* and good quality farmland, 2.5 percent for average quality farmland, and 1.9 percent for fair quality land,” he explains. “These prices are not at the level of increases we’ve seen in recent years, but they are still upward.” He adds that the survey respondents expect the volume of land to be available for the balance of the year to be about the same as during the first six months. Schnitkey explains that the primary purchasers of land are still other farmers and local investors doing 85 per- cent of the buying. The number of non-local investors has slipped, no doubt because of other investment options such as the stock market, he says. 1. For the first half of 2013, respondents indicate that land values increased by 3 percent for excellent and good quality farmland, 2.5 percent for average quality farmland and 1.9 percent for fair quality farmland. 2. On July 1, 2013, farmland prices averaged $13,200 for excellent quality farmland, $11,200 for good quality farmland, $9,000 for average quality farmland, and $8,300 for fair quality farmland. 3. Seventy percent of the respondents indicated that less farmland was sold in the first half of 2013 as compared to the second half of 2012. Partially explaining lower volume was a surge in farmland sales at the end of 2012 on account of uncertainties concerning income tax treatment in 2013 and beyond. Ninety-five percent of respon- dents indicated that there was an increase in land sales at the end of 2012. 4. Volume of sales in the last half of 2013 is expected to remain about the same as the first half of 2013. Twenty- three percent expect more volume, 43 percent expect the same volume, and 34 percent expect less volume. 2 percent were other buyers. 6. Respondents indicated that farmers have increased as a percentage of buyers while local investors, non-local investors, and institutional investors have declined. 7. Respondents were divided in what was expected to be the price change over the next 12 months. Twenty percent expect farmland price to increase, 41 percent expect farmland price to remain the same, and 39 percent expect farmland price decreases. Of the 39 percent expecting decreases, 77 percent expect a price decrease from 0 to 5 percent. 53 percent indicate there is less than a 50 percent chance that it will happen, and 2 percent indicate that it will not happen. 24 percent indicate that a large price decline will not happen. 10. Respondents expected the sales price of corn on the 2013 crop to average $4.92. Most respondents expect 2013 corn yields to be above the five-year average. 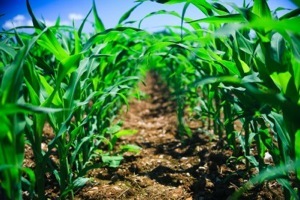 Sixty-six percent expect above average corn yields, 18 percent expect average corn yields, and 16 percent expect below average corn yields. 11. Respondents were given the list of factors on the vertical axes on Figure 1 and Figure 2. 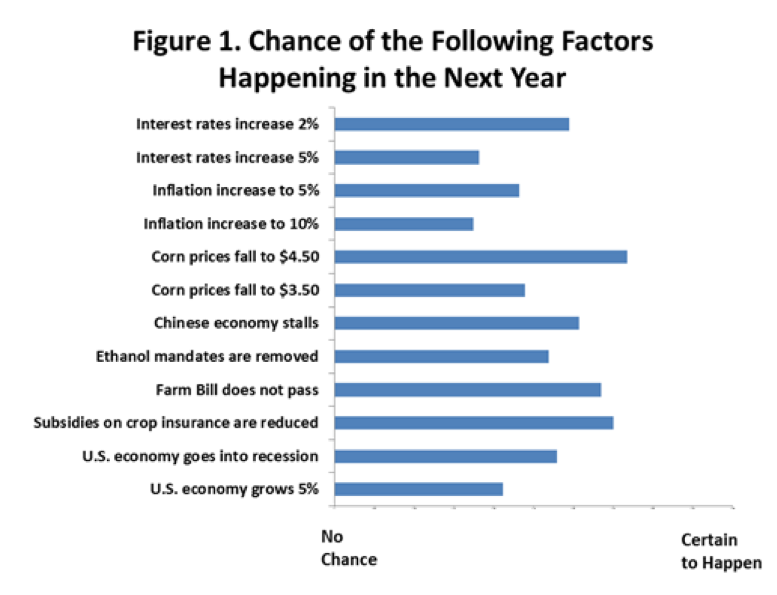 Respondents were asked to rate the probability of each of factors happening in the next year (see Figure 1). 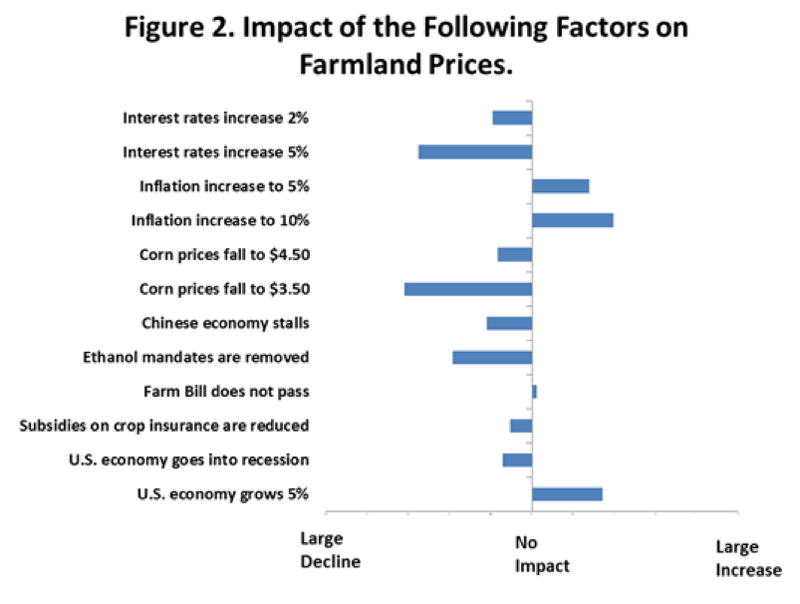 They were also asked to indicate the impact of that factor on farmland prices, if it happened. 12. Most likely factors of occurring are “corn prices fall to $4.50”, “subsidies on crop insurance are reduced”, “Farm Bill does not pass”, and “interest rates increased by 2 percent”. Factors least likely of happening are “infla- tion increases by 10 percent and “interest rates increase 5 percent”. 13. 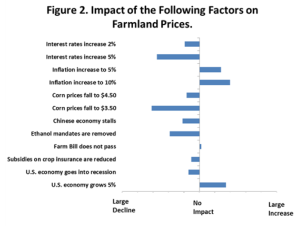 If they happen, the factors indicated of having the most positive impact on farmland prices are “U.S. econo- my grows 5 percent” and “inflation increases to 10 percent”. The factors estimated to have the most negative im- pact on farmland prices are “Corn prices fall to $3.50”, “interest rates increase 5 percent”, and “Ethanol mandates are removed”. 14. Respondents were divided on expected farmland price increases over the next five years. Respondents were asked what they expected changes in farmland prices to average over the next five years (a response of “10 percent” indicates that farmland will increase an average of 10 percent each year over the next five years). Forty- six percent of respondents expected prices to average an increase between 1 and 5 percent the next five years, 9 percent expected farmland prices to remain the same, and 45 percent expected price decreases. 44 percent indicate a less than 10 percent chance of 1980s-style decline of happening, and 17 percent indicate that there is between a 10 and 50 percent chance of it happening. 16. Respondents expect small decreases in cash rents from 2013 and 2014. Respondents indicate that excellent quality farmland had a $388 per acre cash rent in 2013, and an expected cash rent of $374 per acre in 2014. Good quality farmland had a $332 per acre average cash rent in 2013 with an expected cash rent of $318 per acre in 2014. Average quality farmland had a $318 per acre average cash rent in 2013 and expected cash rent of $278 per acre in 2014. Fair quality farmland had $224 per acre cash rent in 2013 and expected cash rent of $212 per acre for 2014. 17. Respondents expect corn prices to average $4.75 per bushel during the next five years. 18. Most respondents expect slight decreases in production costs moving into 2014. Fifty-six percent of respon- dents expect production cost to decline slightly, 21 percent expect production costs to remain the same, and 23 percent expect increases in production costs. 14 percent are variable cash rent lease, and 7 percent are custom farming. 20. Respondents indicated that share rent and modified share rent lease leases declined in use. Variable cash rent leases were the lease type with the largest increase, followed by cash rent. Brownfield Ag News has an interesting interview with Brent Pollard, Chairman of the Illinois Farm Bureau State Young Leader Committee. About two minutes in, he talks about the challenges facing young farmers. The biggest hurdle, according to Pollard, is getting access to the resources they need to start farming: things like land and equipment, for example. The 2013 ISPFMRA Summer Tour is coming up! The tour will hit the Effingham and Shelby area on August 15th and 16th. The tour will include visits to Willow Ridge Vineyards and Winery, the Holland Energy Natural Gas-Fired Generating Plant, the Siemer Milling Flour Mill, and the Lake Shelbyville Dam & Water Management Program. Get a Summer Tour registration form and agenda here. This will be held at the Effingham County Farm Bureau office. Separate registration is required. Coming in Early? Come to the Schroeder’s for an evening of fun! If you will be taking part in the Income Approach Applications class or just want to come in a little early for the tour, you are welcome to join Jim Schroeder and his family at their Lake Sara property for some socializing and networking on Wednes– day evening, August 14. The Schroeders are opening their summer home for you to enjoy some food and refreshments, and maybe some pontoon-boating. They’ll need a head count though, so check off the box on the registration form if you are going to attend. The party will get underway around 5:30. We’ll get back to you later with driving directions, etc. Motor coach will depart at 8 a.m. from Fairfield Inn and Suites, 1111 Henrietta, Effingham. See reservations information below. Lake Shelbyville is a 11,000-acre public lake owned and managed by the U.S. ACE. It was created in 1971 by damming the Kaskaskia River and is the third largest inland lake in Illinois with an overall shoreline extension of 250 miles. The dam was built with goals to improve flood control and draw recreation to Central Illinois. The area has become a destination for millions of visitors yearly who enjoy the likes of camping, boating, fishing, hiking, biking, horseback riding, and snowmobil– ing. Tour will include an ‘underwater’ visit. Join four generations of the Wachtel family with tours and an evening of friendship and hospitality at their 6,000-acre farm near Altamont. Incorporated back in 1984, they are, in a single operation, able to bust nearly every generalization about family farms and factory farms and small farms and large farms. Will travel by private autos departing hotel at 8 a.m.
Siemer Milling Company is a family-and employee-owned company in business since 1882. It supplies wheat flour, germ, and bran to bakeries and mix plants, big and small. This is a Grade A food processing facility therefore there will be restrictions in place regarding taking part in the tour…..no open-toed shoes or sandals, no shorts or bermuda’s, and no loose jewelry will be allowed. Hair nets and lab coats will be provided. Thinking of putting up a farm structure? Representaives from Niebrugge Farm Services will provide an update and helpful tips on the latest technology in place for putting up all and any kinds of farm structures. The Illinois Society of Professional Farm Managers and Rural Appraisers has released its 2013 report on farmland values in Illinois agriculture. Mother Nature slashed corn and soybean yields in 2012 which resulted in skyrocketing grain prices. $7.00 to $8.00 per bushel corn and $15.00 to $18.00 per bushel soybeans were significant and offset much of the yield drop. Farmland truly is what it earns! Net farm income across Illinois was stable to increasing this past year due to higher commodity prices and the payouts from crop insurance programs. The Great Drought of 2012 resulted in some of the largest corn and soybean yield reductions our members had ever witnessed. On an average corn yields were down nearly 50% and soybeans were reduced by one- third. Note: There is a correction to one of the tables in the report. This is for Region 5, on page 43. You can download the corrected table here: Region 5 Sticker Cover.pdf. Here’s an archive of presentations from the 2013 Annual Meeting. You can order a 2013 Land Values report! Just download the form linked below to place your order.